Did you know that starting your own online business is actually quite easy? It’s coming up with great ideas that requires a little more work and time. But legally setting up a new business really just takes a few minutes for someone who knows what they’re doing. I was lucky that a friend of mine was able to walk me through the process to let me know what I needed to do to create a legal business. 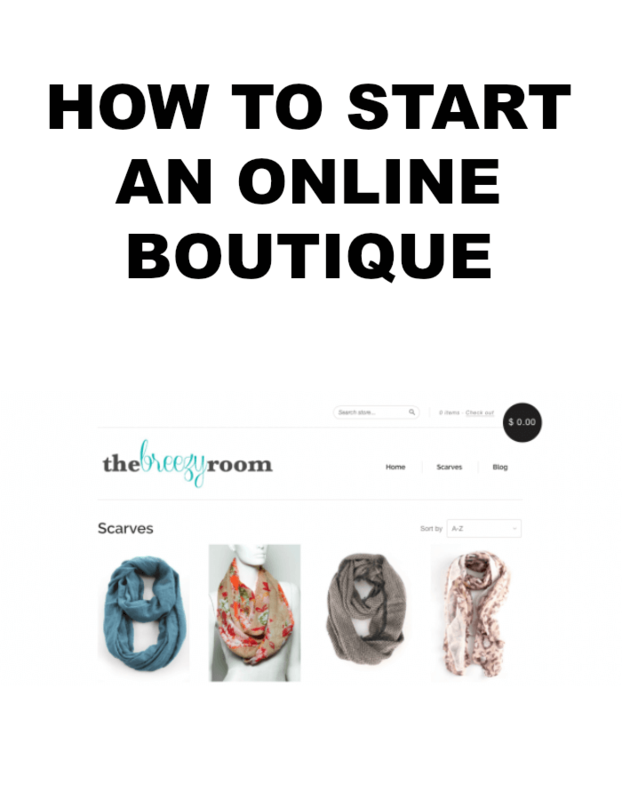 In case you’ve been wondering about that too, this is what you need to know about how to start an online boutique. *Affiliate links included to help guide you to my favorite products! 1) Create an LCC, Corporation, S-Corporation, etc. If you google “Secretary of State [Insert your state]” and go to their website, there should be a link to find all the information you need. On Missouri’s there is a tab that says “Start a Business.” This link tells you how to apply online for the type of business you want to start. I consulted an accountant for this step just to make sure I filled out the forms correctly. You should also use this site to research business names in your state to make sure the one you want is available before you fill out the application. You can apply online for an instant Federal ID Number at IRS.gov. You will use this number to file taxes each year and to verify that your business legally exists when you are doing business with other companies, establishing a business checking account, etc. If you’re selling retail, this is required. Most real wholesale websites will not let you create an account without one. This just ensures that you are responsible for collecting sales tax on the products you sell and can turn them in to your state. It took me a little longer to get this number. I was able to apply online, but had to mail in a bond to cover any future unpaid sales tax and it took about 2 weeks to get the letter that assigned me a sales tax number in the mail. This is extremely helpful in keeping your accounting records straight and keeping the business money separate from your personal finances. Once you start making money, you can withdrawal whatever amount you like to start paying yourself. I typically write a check from my business account to my personal account to pay myself. My business was linked to my checking account in Quickbooks Intuit and it made the accounting process so easy. I also think it’s helpful to make as many purchases as possible with your debit/credit card. This way you have an online record of them instead of having to keep every single receipt. There are many shopping cart services to choose from out there, including selling your items through Amazon, eBay or Etsy. But I do recommend creating your own website as well so that your sales aren’t dependent on the decisions of those companies. I used and personally recommend Shopify which has multiple plans to fit your needs and your budget. For a beginner, it seemed to make the most sense. You can also host your own shopping cart on a website platform like WordPress. There are a lot of options out there, so do your research to find one that is the best fit for you. This is something I admittedly didn’t think about until AFTER I made my first sale, which was a mistake. I ended up going to the post office, purchasing a box from them, then stood in line to get my package stamped and shipped. As soon as I got home I headed to uline.com to purchase packaging (they have all sorts of options to best fit your products), purchased adhesive shipping labels, and set up an account with Stamps.com so I could print my own labels (shipping costs included) directly from home. This allows me to prepare everything at home and just drop my packages off at the post office at the end of the day. Places like Office Depot also let you drop off your packages with them will ship them via USPS, Fedex, or UPS. You can also ship priority mail and schedule a time for the USPS to come pick up the packages. There are a lot of different shipping options, so this is another one that requires a little research to determine the best fit for your business. Another handy thing to have for shipping is a scale. They are more affordable than you would imagine! Finding REAL wholesalers is actually a lot harder than it seems. Google generally brings up hundreds of companies that claim they are wholesale, but are really just discounted retailers. That is not who you want to be buying from. Talk to trusted friends or connections in your industry to find out about legitimate wholesalers. Or check the tags of the products that you like and research the brands that way. Just know that if you consult someone who will be a future competitor, they might be a little hestitant to help you out. If you follow these steps you’ll be well on your way to owning and running your own online boutique. There is still a lot of other stuff to figure out like product photos, marketing, finding your ideal customers and delivering a great buying experience to customers, but you’ll be learning all of those things before you know it! I want to do this!!!!!!! I have a couple ideas in my head but we will see when/if I’m ready to make the plunge. Well when you are, I’m here to help! :) We can discuss this on Friday too! I want to hear your ideas. Loved this blog! I just recently listed a few things on ebay and I’m getting bids already. I was going to continue to sell on there just as a little extra cash from things laying around…any advise? I don’t think I need the business license and stuff yet…however if I find success I may consider it! I wouldn’t get the business license until you need to buy and resell wholesale products. Good luck! First, I would like to applaud and thank you for this post. Well written and exactly what I needed for a confidence boost. One thing that really hit home and deep I might add, is the fact that I am having the hardest time finding legitimate wholesale distributors. I ran across a few sites that sell the type of clothing style I want but they are low quality, faux wholesale sites like dresslink and cndirect. com. Unfortunately, I have connections to someone that can point me in the right direction. Is there any information that you can share? That’s all I need, I can grab it by the horns and take it from there. Hi Kala thank you so much for this article, it is insightful. I hope to open online boutique some day hopeful this year and I will refer to these great ideas. This is pushing me in the right direct. Thanks! This information was quite inspiring and insightful. I live in the Caribbean and I also want to create my online business. I know the process is different, but still remain the concept in that get registered and keep business revenue separate from personal funds for clarity. My biggest problem suppliers but I am determine to have my own professional business up to par. Thank you. Thank You for sharing! I’m ready to start my online store and your advice has guided me in the right direction. Like most of us I’m having a hard time finding wholesale. Is there anything you can share about wholesalers? Thank you for this information. I’ve been dreaming of starting my own on line Instagram boutique. With Instagram a license needs to be in affect as well? Like others I’ve been having trouble finding legit wholesale sites to purchase my clothing items. . Any suggestion would be appreciated. Stephanie, You won’t be able to access wholesale sites without a federal ID number and sales tax number for your business. No matter where you sell your products, you’ll need to charge taxes to stay in compliance with the law. Check out fashiongo.net when you get a chance, it’s a great one to start with! Good luck! Thanks Kala,I’m a single mom with two kids with ADHD so they need me home this will be an alternative to gain income I’m also a fashion designer…. That depends on your state and how much inventory you invest in from the beginning and the ecommerce site you choose to use. I believe it was less than $100 to get everything registered. I love all the information you shared. Hi! How did you plan for how much inventory to invest in initially?! Gina, I really just based it on my budget at the time. I basically set an amount for how much I was comfortable with losing if it was a bust. Then when you make that money back, place your next order! How long did it take you to get all of the necessary licensing and numbers? Your description is exactly what I have been looking for by the way. I have searched and searched for specifics and yours are by far the best! Hey Ashley! I don’t think it took too long, most of it I could do almost instantly on my computer. I believe the state sales tax number took a couple weeks because I had to mail in a money order deposit and wait for my sales tax number to be mailed back to me. So probably in 4-6 weeks I was ready to go? Hope that helps! This post was SO helpful the only thing I’m still confused about is if I set it up as an llc or assumed business name. I will only be online. Also if there isn’t sales tax in my state do I still need a sales tax number? I would set up as an LLC. I think that makes it easier to keep everything separate, but maybe you can talk to an accountant or something to help clarify the difference? As for sales tax, I’m not sure because I live in MO and we do have it here. Maybe google “sales tax and use in [insert your state]” and see if your state offers any information on it? Hope that helps and good luck with your online store! Actually Melissa, I think you’ll need the sales tax ID number either way so you can purchase from wholesalers. They require that information before letting you create an account and usually you can’t even see merchandise or prices until you have a confirmed account. Thank you for actually posting the Legal stuff! It has been so hard to find!!! Thank you so much I just want to be a better mom and doing something from home will help me to achieve that. Great post! I’m in the process of opening a brick and mortar boutique, however I’m having difficulty finding a location. I am really wanting to get started and have thought of starting online in the meantime. Would it be fine to start out as Sole Proprietor for online sales? How much inventory do you purchase? I was always advised to at least start out as an LLC, but you should consult an accountant or lawyer about that if you’re not sure! I think your budget would determine how much inventory to invest in. You want enough to keep your site interesting but also a small enough inventory that you can make your money back fairly quickly to get in the green! Do you have any ideas as far as home decor, small knick knacks? hello I’m about to open a boutique can you send me some pointers and smooth some things over with me on the process.